Each week, Voice of Russia hosts Red Line, a discussion about the events of the week as seen from Moscow. This week, airstrikes in Libya, Elizabeth Taylor and Manmohan Singh. Ekaterina Kudashkina: This week all eyes are on Libya again, so we will start with "Operation Odyssey Dawn.” We will try to see all the pros and cons of the operation and explain Russia’s position. We will also discuss the last interview of Elisabeth Taylor, which actually reveals a special dimension of her personality. And finally, our man in the news this time will be India’s Prime Minister Manmohan Singh, who unexpectedly found himself in the center of a huge corruption scandal exposed by WikiLeaks. First, let’s have a closer look at the Libyan crisis in Beyond the Headlines - we will try to understand the motives and the logic of "Odyssey Dawn,” the multinational military campaign in Libya that is currently in full swing. As the U.S. and some of its allies launch fresh air-strikes at Gaddafi’s forces, the world’s public opinion is confused over the real goals of the operation and is equally split in assessing its final outcome. Sergei Strokan: The decision to launch the operation was not made overnight. It was discussed for more than a week on different levels, bilateral talks were followed by NATO extraordinary meetings, then there were meetings of Arab League and African Union. During that time, U.S. President Barack Obama and his Western partners were criticized for indecisiveness. Ekaterina Kudashkina: But this resolution and this decision-making was hasty, as we all know, and it looks like the resolution was considered the only remaining practical way to stop the Libyan leader from slaughtering his own people. Sergei Strokan: It was approved just hours before another bloodbath in the town of Benghazi. So it looks like a last-minute move, reluctantly made in a situation when there is, seemingly, no other option; when action and inaction are equally risky. Ekaterina Kudashkina: And here we come to the position of Russia. Do you think that regardless of how long the Libyan odyssey lasts and what its practical results are, resolution 1973 in a way marked a watershed in Russia’s relations with its key Western partners? Sergei Strokan: I think the logic of the Russian side is still largely misunderstood by analysts and media both at home and abroad. Russia is known for its opposition to the very idea of foreign intervention in the domestic affairs of sovereign states, but this time, instead of vetoing the resolution, Russia as veto-wielding member abstained, and that was something fundamentally different. Mira Salganik: Although many analysts insist that the Russian decision on Libya is inconsistent and contradictory, I find it quite rational, even pragmatic. Why? It puts Moscow in a win-win situation. Sergei Strokan: I think you have a point. First, by resisting the temptation to veto the resolution, Moscow avoided another serious clash with the West and almost inevitable accusations that it secretly coddles dictators all over the world like Muammar Gaddafi. Russia’s abstention has the following message to its Western partners – we don’t consider military interference in Libya as the optimal way to settle the problem, we see many risks and drawbacks, but if you are ready to take the responsibility and bear the full consequences – go ahead, this is your choice, but not ours. Also, by denouncing the military option Russia would likely win the sympathy of Libyans who pledge to fight against “foreign aggression” as well as the backing of the Arab world. I think we can agree that by not openly siding with Colonel Gaddafi who at any rate is hardly seen as a political survivor, Moscow leaves the window of opportunity open for establishing new relations with the next Libyan leadership. All in all, to me Moscow voting in UN Security Council looks as a smart move . Ekaterina Kudashkina: Speaking of results, I suggest we now to our expert. Our guest speaker is Dr. Berny Sèbe of the University of Birmingham, UK. Ekaterina Kudashkina: First of all, Dr. Sèbe, you said the human cost of the conflict is really downplayed. What kind of people are the Libyans? Berny Sèbe: The Libyan people are a very welcoming population in general, and they also tend to be a very peaceful population, so this is really a heart-breaking thought to imagine that they are currently torn between rebels and forces loyal to Colonel Gaddafi. There is definitely a significant human cost for the country’s relatively small population of around 6 million people. Ekaterina Kudashkina: This is very small, in fact it is less than half of the population of Moscow. Given this, it looks a little strange that news reports show pretty large crowds of supporters of Colonel Gaddafi. How shall we explain that? Is it just a loyalty to the leader? Or perhaps he is just too controversial to be described only as a tyrant? What kind of person is he? Ekaterina Kudashkina: As we always try to show in this program, life is more complicated than it seems. Berny Sèbe: Exactly, in particular because now Gaddafi is keener than ever on making sure that his position in the south remains as strong as possible, because this the path by which he can get more mercenaries from West or Central Africa to supplement his own regular army. Ekaterina Kudashkina: But given the accumulation of warships and airplanes around Libya, as far as I understand, there is no chance for Gaddafi to remain in power. Is that correct? Ekaterina Kudashkina: Could the Western coalition be in for another Iraq or Afghanistan? Berny Sèbe: I do not think that it is likely, because it has been made clear by everyone involved in the coalition that there will not be any ground forces deployed on the ground. Ekaterina Kudashkina: And now we move on to our second heading, Between the Lines, in which we usually discuss a notable publication of the week. This time I suggest we choose a notable publication about a person—it is Elizabeth Taylor’s last interview published in the February issue of Harper’s Bazaar. Sergei Strokan: People were always curious about her marriages, about her jewels, something they’re curious to learn about any film star. Sergei Strokan: As far as I know Taylor helped raise more than $100 million to fight the disease. Ekaterina Kudashkina: I suggest that we should remember her as she was, the queen of the silver screen. In one of her last interviews, she said she never meant to be a queen, she was only playing a part of the queen, she was an actress. Sergei Strokan: We speak a lot about the human dimension, but when you get Elizabeth Taylor as a hero of the front-page story in “Pravda”, this is something. Ekaterina Kudashkina: And now we are joined by Nina Tsyrkun, author of a Russian book about Elizabeth Taylor. Would you be so kind to tell us about Elizabeth Taylor’s visit to the Soviet Union? Nina Tsyrkun: This happened in 1975. Along with other Hollywood stars, Elizabeth Taylor arrived in Leningrad to appear in the U.S.-Soviet film The Blue Bird based on a play by Maurice Maeterlinck and directed by American cinema veteran George Cukor. That was a joint venture of the Twentieth Century-Fox Film Corporation and Russia’s Lenfilm. Despite the cast, there were numerous pessimistic forecasts regarding the movie, given Cukor’s advanced age - he was 76. Apart from renowned ballerina Nadezhda Pavlova who played the part of the blue bird, the movie features a number of great actors, such as Margarita Terekhova, Georgy Vitsin, clown Oleg Popov, as well as Jane Seymour Fonda, Ava Gardner and Elizabeth Taylor. Taylor played four parts: Queen of Light, Mother, Witch and Maternal Love. Having found themselves under quite unusual conditions (uncustomary food and a lack of comfort) all the American actors started considering to quit - all but Elizabeth Taylor. Maybe because otherwise she would have paid a $2 million forfeit, but I think she simply was an inexhaustible toiler, a real professional. Regardless of all her hardships - she did not even have her own trailer and had to share a bathroom with Ava Gardner - her acting was perfect. Ekaterina Kudashkina: Could you expand a little bit on your book about Elizabeth Taylor? Nina Tsyrkun: The book was published in 1997. 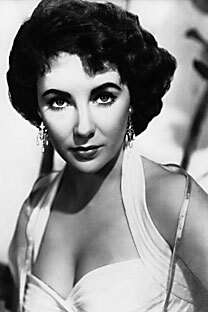 Elizabeth Taylor was the embodiment of a real American star for us. She became especially famous in the Soviet Union after the Soviet audience watched the Cleopatra movie featuring her. She played a great many roles by that time but most of them were unavailable for Soviet people. After the Cleopatra film, our women started applying mascara and black pencil eyeliners. At the time those were soft pencils used by artists, very hard-to-find and expensive. But all Soviet women nevertheless sought to look like Elizabeth Taylor. Ekaterina Kudashkina: And we will speak with the popular Russian actress, Margarita Terekhova, Elizabeth Taylor’s co-star in The Blue Bird. Margarita Terekhova: We appeared in The Blue Bird movie together. She was irresistible. It was very interesting for me to act by her side and watch her play her part. While making The Blue Bird, everyone was so very kind to each other! I never had an experience like that again in my life; and most likely won’t have it again. I have profound regret and sorrow on her death. Ekaterina Kudashkina: Now we are turning to Red Line’s concluding heading Man in the News. This week we will speak about Manmohan Singh, the prime minister of India, who found himself in the center of a vote-buying corruption scandal. The scandal was triggered by the publication of WikiLeaks’ latest expose. It was a secret cable, sent in 2008 by an India-based American diplomat, who reported that the ruling Congress party was bribing opposition MPs in preparation for a crucial vote of confidence over a civilian nuclear deal with the U.S.—a highly politically charged issue in India. While the prime minister denied the allegations and questioned the veracity of the cable, the opposition claimed that the Manmohan Singh-led government had no more moral authority to rule the country and that he should step down. Mira Salganik: This is not the first scandal—far from it. There has actually been a chain of corruption scandals, although until now no one has pointed a finger at Manmohan Singh personally. Sergei Strokan: I think when we speak about corruption, we have to understand that a corruption-free-world remains a distant dream. Let us be frank, corruption is always there in politics, be it in India, China, America or Russia. Of course, the degree of corruption radically differs from country to country, but what is striking in the latest Indian corruption scandal is that this time the allegations of corruption are laid against Manmohan Singh, who as a personality and as a political leader can hardly be associated with any murky deals. Mira Salganik: Unlike all his predecessors Manmohan Singh was really a man of the masses. He was born in a remote village with no drinking water, no school, nothing. That a boy from a village like this worked his way up to Cambridge, he must have great abilities and integrity. After that, he taught in a number of prestigious institutions, including the Delhi School of Economics. Sergei Strokan: Let me add to this that last year he was described by Newsweek magazine as “the leader other leaders love.” In fact, Manmohan Singh has gained a worldwide reputation as the architect of “manmohanomics”—the economic reforms that he began in 1991 as India’s finance minister. Mira Salganik: He laid the foundation of India’s spectacular economic and political transformation that have made it one of the world’s hottest markets. Sergei Strokan: Yes, I met Mr. Singh a couple of years ago when he was on an official visit to Moscow, and he spoke to a group of Russian intellectuals, journalists and artists. I remember I was impressed by his openness and sincerity, even the way he greets you, how he looks into your eyes. He told us that primarily he considered himself to be a teacher, not a politician. Mira Salganik: I met him both in Moscow and in Delhi. I asked him what he thought was the most remarkable feature of India. He said it was the diversity of India, which should be not just simply tolerated – it should be celebrated. Sergei Strokan: OK, but let’s return to the corruption story. I will begin at the end. In 2008, the Congress Party-led government won a vote of confidence over its proposed civilian nuclear deal with the U.S. It was a crucial vote and the deal was strongly opposed both by the Communists and the Hindu nationalist Bharatiya Janata Party (BJP). Ekaterina Kudashkina: As far as I remember, under the treaty, India gained access to U.S. civilian nuclear technology and fuel. Sergei Strokan: To me there is no doubt that this deal really matters for the Indian economy, but at the same time, the deal was opposed from left and right. The Communists claimed the accord could give the U.S. too much influence over Indian foreign policy. Hindu nationalists from the BJP claimed the deal would undermine "India's strategic autonomy while promising illusory energy security." Lurking in the shadows was the question of American investments, too. The anti-American sentiment is quite strong among the Indian left, it is part of their mindset, but in this case it was mixed with immediate political maneuvering to trip the ruling Congress party. However, in the 2009 elections, it was again the Congress party that won. Mira Salganik: After the elections, a parliamentary committee was established to investigate the allegations of vote buying and it came to the conclusion that there was no sufficient evidence. But in the WikiLeaks cable, a diplomat says that his informer told him that he saw with his own eyes chests of cash, some $25 million. Sergei Strokan: I understand this sounds impressive, but still there are no accusations of Manmohan Singh’s personal involvement. Last but not least, the accusations came just days after a new report from KPMG stated that corruption is threatening India’s growth. Is it a dangerous fall-out of India’s prosperity, globalization, moral degradation – or what? Ekaterina Kudashkina: This is what we are going to investigate with our expert, George Verghese, a professor at the Center for Policy Research in New Delhi, India. George Verghese: I haven’t seen this KPMG report, I cannot comment directly on it. But there was certainly a lot of debate and discussion on issues dealing with various aspects of corruption, and this has been going on. It is obviously political, because the charges have been made against the government in this case; either it deliberately being part of corrupted forces, or assisting or covering up corrupted purposes. There was some report based on a WikiLeaks report dispatched by the Americans in Delhi to the State Department concerning the voting on the U.S. nuclear deal. The government has the view that if there had been any corruption, and there might well have been, they are taking action on it through proper channels: parliamentary commissions, as well as through investigatory agencies to establish the fact, proportion guilt, and then following due process, take action against those found guilty in a number of different cases. But the opposition thinks that this shows that it is a perfectly corrupt government, and the government leaders are corrupt, and so on. I think that is unfortunate, because I think there might be corruption in some of these matters, not in the nuclear deal but in the Congress games and some other matters they were talking about. These are all under investigation. Once the due process finds something, action will follow, and anyone found guilty will have to face the consequences. So now it is premature to come to any conclusions. But at the moment it has become a political football.